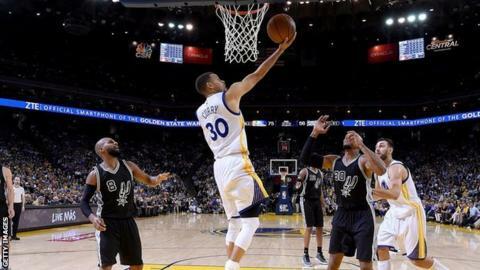 The Golden State Warriors became only the second NBA team to win 70 games in a regular season when the reigning champions beat the San Antonio Spurs. Steph Curry scored 27 points in a 112-101 win as the Warriors hit back from their second loss in three home games. The victory secured them home-court advantage throughout the play-offs. The California-based team can break the Chicago Bulls record of 72 wins - set in the 1995-96 campaign - by winning their remaining three games.